Stephen Stout, left, and Frank Festini stand by a rendering that shows a proposed lookout tower in Southport Park that the Sasquanuag Association plans to develop. One of the town's least-known parks is gaining a new identity. 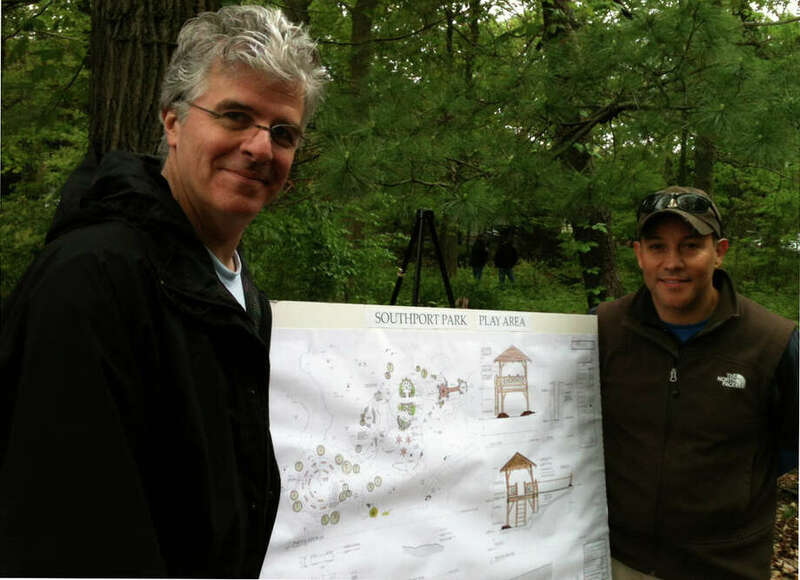 The Sasquanaug Association, a neighborhood group that owns Southport Park on Old Post Road, is working to transform the park as a gathering place for children and adults, with extended walking trails, viewing stations that overlook Southport Center and the Metro-North Railroad tracks, play stations, a nature information station, a lookout tower, a gathering place, a bridge and a more visible entrance. "Our goal is to make it public, make sure everyone knows it's here," said Frank Festini, president of "Friends of Southport Park," a non-profit set up to collect donations for the planned improvements. On Saturday, several dozen parents and children visited Southport Park to learn about the proposed improvements and to walk on trails throughout the 11-acre property next to Southport Racquet Club. In the past, Southport Park was visited primarily only on Earth Day, when Southport residents and members of the Southport Volunteer Fire Department cleaned up the park, said Ellen Levinson, a member of Sasquanaug's board of directors. "But this year we wanted to showcase what our plans are for the park because we're in the process of restoring the park. This is really something special. This is an area that was rarely utilized ... We want to make it a place for everybody," Levinson said. Dan Zelson, a member of Sasquanaug's board of directors, said the Old Post Road in the Southport section of town has seen a lot of improvements recently, such as the opening of the Delamar Hotel and Gray Goose Tavern, and the extension of sidewalks toward Pequot Avenue. He said Southport Park was "kind of the hole in the wheel." "Part of our charge is really to keep the village vital. We looked at this park as kind of the cornerstone of that," Zelson said. Festini said Southport residents want the park to remain as natural as possible and don't favor plastic or metal structures in its upgrade. He said structures will be built from materials already in the park, such as stones and about 30 dead or damaged trees that were cut down. Carl Carfi, an architect with Mark Finlay Architects in Southport, said the planned improvements work with the natural landscape. "We took some inspiration from structures that can be found in America's national parks," he said, adding that the gathering area would have log benches and a stone lectern, and the lookout tower would resemble fire lookout towers in national parks, though much shorter. Southport neighborhood residents hope teachers in nearby schools bring students to the park to learn about the environment, Zelson said. Don Burton, a member of Sasquanaug's board of directors, said kids can also take photos of flora and fauna in the park and upload them to "The Encyclopedia of Life," a website that accepts information about environments around the world. Sophia Festini, 7, Frank's daughter, already likes the wooded area. "I love it because I have a place to relax while walking," she said. Sophia said she was most looking forward to a fort that will be built in the park "because it's a place where kids could play and I could too." Tish Burton, a Southport parent, said she too looks forward to the park's restoration. "It's going to still have this beautiful natural look, and I like that there's going to be a playground to bring the kids to," she said. Tish said her 5-year-old daughter, Whitney, is particularly partial to stones in the park that are in the shape of waterfowl. The stones, placed on the site in the 1950s when the Sasquanaug Association acquired the park, may date to the 1600s when Indians were the prevalent community in Southport and Fairfield. "The story goes the Natives carved them out and worshipped them," Festini said. As of Saturday, the first stage of construction -- tree clearing -- was finished, and the next stage -- site work and plantings -- was scheduled to begin in a few weeks. Carfi said evergreens will be planted around the park's perimeter to screen noise from the Post Road and trails will be extended, rehabilitated and crowned to avoid water pooling. The third and final stage is when the structures will be built, and sound attenuation walls may be added as well. Sasquanaug members hope the park is visited often after the improvements are finished. "The best preservation for this park is going to be use," Festini said. "Use is the number-one thing for this park to be preserved." The Sasquanaug Association has donated $150,000 for park improvements and the Southport Area Association gave a $20,000 grant, Zelson said. He said residents, including Sasquanaug board members, donated another $100,000 and that "Friends of Southport Park" needs about $100,000 more to fully fund the project. "In an ideal world, we would have the funds raised by the summer and have the work completed by the fall," Zelson said. People who would like to make a donation for park improvements can go to the website, www.southportpark.org, or send a check to "Friends of Southport Park," c/o the Russell Agency, 317 Pequot Ave., Southport, CT 06890.